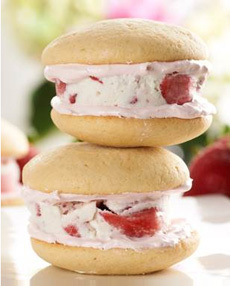 Another beat-the-heat-treat from QVC’s chef David Venable: Strawberry Shortcake Ice Cream Sandwiches. The “sandwich” cookies are cake-like, and a combination of marshmallow fluff and whipped topping stands in for the whipped cream, which wouldn’t hold up in the sandich. Strawberry shortcake ice cream sandwich. Photo courtesy QVC. 1. LINE a sheet pan with parchment paper. Remove the ice cream from the freezer and let it sit at room temperature for 4 minutes. Place the ice cream in a bowl of a stand mixer and whip the ice cream until soft, but not melted. 2. FOLD in, by hand, the strawberry slices. Pour the mixture onto the prepared baking sheet and spread evenly, about 1/2“ thick. Cover the ice cream with another piece of parchment paper. Place the sheet pan in the freezer and freeze until hardened. 3. REMOVE the sheet pan from the freezer. Using a cookie cutter, make circle-shaped ice cream cutouts. Place ice cream cutouts back into the freezer until needed. 4. MAKE the cookies. Preheat your over to 350°F. Line 3 cookie sheets with parchment paper, set aside. 5. COMBINE the flour, baking soda, and salt into a medium bowl; set aside. 6. COMBINE the buttermilk, lemon juice and vanilla into a small bowl; set aside. 7. CREAM the butter and sugar together, using a stand mixer on medium speed, until the mixture becomes pale and fluffy. Add two eggs and mix until blended. On low speed, add the flour and buttermilk mixtures, alternately. Make sure to begin and end with flour mixture. Mix until well blended. 8. PLACE 2 tablespoons of batter, about 2” apart, onto the prepared cookie sheets, using a spoon. Bake for 12–14 minutes. Place the cookies on a cooling rack, and allow them to cool completely. 9. MAKE marshmallow creme layer: Place the whipped topping, marshmallow fluff and the strawberry syrup into a bowl of a stand mixer fitted with a whisk attachment. On medium speed, whip for 2–3 minutes until light and fluffy. Refrigerate marshmallow topping until needed. 10. ASSEMBLE: Take two cookies, flat side up, and evenly spread marshmallow creme on each cookie. Place a pre-cut ice cream circle on top of 1 cookie and top with another cookie. Freeze until ready to eat.